Turkey’s Erdogan has turned his way towards a one-man regime, adhering to similar strategies employed by all dictators: Erdogan continuously accuses all his critics of being terrorists or traitors because they are not amenable to his antics. Public servants who don’t comply with his illegal orders, journalists who don’t flatter, politicians who find him at fault, lawyers who perform their legal duties with integrity, and his current or prospective political rivals are all but a small number of those being labelled as, terrorists or traitors. For years, Turkey’s anti-terrorism legislation has been criticised by the European Union, the Council of Europe, the United Nation’s human rights bodies and international human rights organization. The European Union and the Council of Europe has urged Turkey to make its anti-terrorism legislation compliant with human rights standards, including with the European Convention on Human Rights and the jurisprudence of the European Court of Human Rights. At present, Turkey’s anti-terrorism legislation consists of two separate laws: the Turkish Penal Code (5237) (“TPC”) and Anti-Terrorism Law (3713). Many articles of the Anti-Terrorism Law were rescinded but article 5, which is still in force, stipulates the aggravation of the terrorism-related sentences by half. The problem is that the Turkish Penal Code contains neither the definition of what constitutes armed organisations and armed groups nor the offence of membership. The lack of legal definitions and criteria of what constitutes an armed terrorist organisation and the offence of membership in the armed terrorist organization makes these articles prone to arbitrary application and abuse. Vague formulation of the criminal provisions on the security of the state and terrorism and their overly broad interpretation by Turkish judges and prosecutors make all critics, particularly lawyers, human rights defenders, journalists, and rival politicians, a potential victim of judicial harassment. This indistinct area under the Turkish Penal code is actively used by the Turkish government to investigate, prosecute and convict opponents. As it has become a common practice in after the 15th July Coup attempt, 402.000 individuals have been investigated, prosecuted and / or convicted for terrorism offences stipulated in article 314 of Turkish Penal Code. (TPC). Only in 2017, 21.833 women have been indicted with the charges of being the founder, the leader or the member of an armed terrorist, of those 226 are under 18 years old. 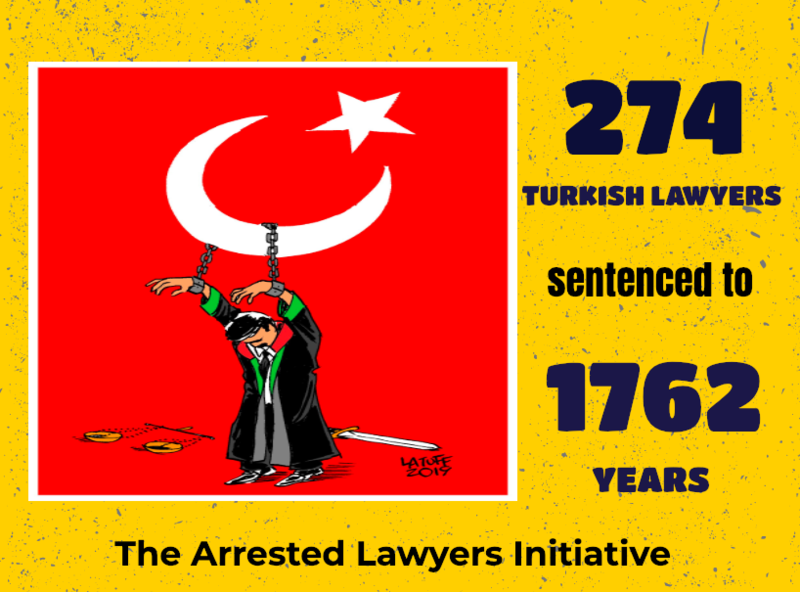 These statistics highlights that Turkey has indicted 221,366 people with the charges of being member or leader of an armed terrorist organisation within last five years. Erdogan also has been using the vague formulation of the anti-terrorism legislation in his hostage diplomacy. According to a report entitled “Erdogan’s Hostage Diplomacy – Western Nationals in Turkish Prisons” undertaken by the Foundation for Defence of Democracies (FDD), more than 30 Western nationals have been jailed in Turkey since the failed military coup of July 15, 2016. Almost all of these foreign citizens were accused of terrorism-related offences. Besides foreigners, deputies of People’s Democratic Party (HDP) and the Republic People’s Party (CHP), the chairperson and the director of the Amnesty (Turkey branch) Taner Kilic and Idil Eser, revered philanthropic Osman Kavala, 1,542 lawyers including presidents of 14 regional bar associations, more than 150 journalists, and innumerable others have all been accused of being member of an armed terrorist organisation or aiding and abetting one or more of those. Although Erdogan has so far disregarded and indignantly refused the calls to reform terrorism legislation, it would be very timely for European leaders to insist on it. Because, for a while now, Erdogan is very vulnerable due to Turkey’s deteriorating economy and it seems that he now wants to improve his relationship with Europe. For that reason, the European Union is now in a position to exercise influence and leverage its potential economic contribution over Erdogan so as to take advantage of his vulnerability to push him towards reforming the anti-terrorism law. Armed Organisation Article 314 (1) Any person who establishes or commands an armed organisation with the purpose of committing the offences listed in parts four and five of this chapter, shall be sentenced to a penalty of imprisonment for a term of ten to fifteen years. Armed Organisation Article 314 (2) Any person who becomes a member of the organisation defined in paragraph one shall be sentenced to a penalty of imprisonment for a term of five to ten years. (3) Other provisions relating to the forming of an organisation in order to commit offences shall also be applicable to this offence. In its judgment E. 2006/10-253 K. 2007/80 of 3 April 2007, the General Criminal Board of the Court of Cassation made a definition: The group has to have at least three members; there should be a tight or loose hierarchical connection between the members of the group, the members should have a common intention to commit crimes (even though no crime has yet been committed); the group has to present continuity in time; and the structure of the group, the number of its members, tools and equipment at the disposal of the group should be sufficient/appropriate for the commission of the envisaged crimes.